The Mako Networks 8875 Gateway is designed to provide a internet Gateway for large business offices, remote hub sites and general use where security is a high priority. This model comes in two versions, the 500 model and the 1000 model. Dual Mako Networks 8875's High Availability (HA) provide fail over and restore automatically, without losing inbound VPN connections. 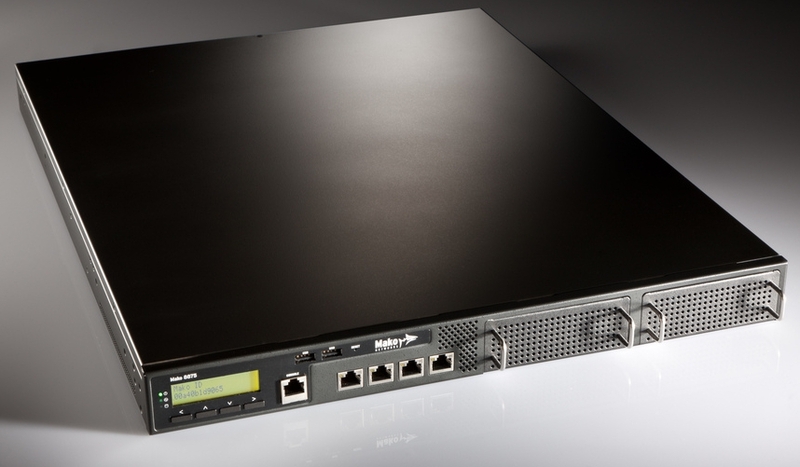 The Mako 8875 Gateway is available in a 500 and 1000 model, supporting up to 500 concurrent IPSec VPNs and 1000 concurrent IPSec VPNs respectively. 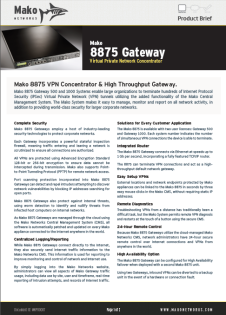 Download the Mako Networks 8875 brochure, which contains a comprehensive listing of technical specifications, compliance statements and awards - download the PDF version by clicking the brochure thumbnail. Mako Networks and IT Consulting and Services entered into an agreement in September 2012 where IT Consulting and Services will sell and support Mako Network products in Singapore. The Mako Networks range of security appliances also includes datacentre-grade Internet gateways and larger VPN concentrators. Please refer to other pages on our site for the Mako 6500 and 7550 models. The FIX store concept has proven popular, with millions of customer transactions processed each month across the company�s 12 location network. Grant Sutton, IT Manager for Star Metro - " the systems used in FIX stores to provide better reliability, visibility and reporting"
�We ended up building 27 POS systems all up for the stores plus one petrol station,� says Grant. The largest challenge for the new FIX store networks arrived in September 2011, when New Zealand played host to the Rugby World Cup. �We had queues of people 30 deep in the store for the Rugby World Cup. It was by far the busiest time we�ve ever had. We even had to set up a temporary POS terminal in the store to deal with the overflow." For more information on the implementation of FIX Convenience Stores POS Terminal Network.